HypnoBirthing® helps you achieve a calmer and gentler birth, allowing you to bring in babies in a gentler and calmer way with hypnosis; hypnobirthing classes teach you to give birth confidently, as calmly, safely and gently as possible. This method applies both for healthy women and women who need medical assistance because of special circumstances. A hypnobirthing birth empowers the mother and allows a more natural birth. Christine Deschemin is a certified hypnotherapist, NLP practitioner and HypnoBirthing® specialist. The course contains five 2½ hours sessions. If you are very near your birthing time, please contact us so that we can make special arrangement for individual hypnobirthing classes with you. Deep relaxation and affirmation recordings. Class handouts, including visualisation techniques. One to one private session for breech baby or over due date, if required. HypnoBirthing® does not promise painless birthing, though many HypnoBirthing® mothers do report having a relatively pain-free birth or one that they were able to manage easily. When the causes of fear-tension-pain that constrict the birthing muscles are eliminated, birthing can be accomplished in a shorter time and much more comfortably. A relaxed mother’s body will produce more endorphins and oxytocin, nature’s own relaxants. HypnoBirthing® mother may experience sensations of tightening or pressure, but most describe their birth experience as working with their body through the sensations, and thus avoiding the excruciating pain that is frequently spoken of by women who choose other methods of preparation for birthing. What if my doctor/midwife is not familiar with HypnoBirthing®? Can I still use this method and how can my healthcare providers help me to achieve my HypnoBirthing goals? More and more care providers are becoming aware of the benefits of HypnoBirthing®. In class, you will learn how to create your birth preferences, which will help you communicate your birthing choices to your doctor, midwife, and nurses. If your care provider is not knowledgeable about HypnoBirthing®, you can discuss the techniques you will be using and the type of calm birthing environment that you desire. The answer is YES. 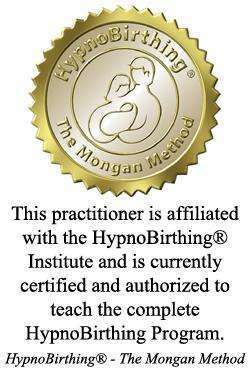 In HypnoBirthing® classes you will learn relaxation skills that will be useful to you, your partner and your baby, regardless of the circumstances. In the event that medical interventions of any sort are needed, you will find yourself better prepared to remain calm and in control. Moms who have needed cesareans for medical reasons report that they were totally relaxed before, during, and after the procedure. Many report they needed less medication following the birth, and were able to return to normal functioning in a shorter amount of time. A hypnoBirthing mother is totally aware and may return to a conversant state or choose to become mobile whenever she desires. You will remain definitely conscious during self-hypnosis. The HypnoBirthing mothers are deeply relaxed and are an active participant in the labor process. They often find they experience time distortion, are able to rest, and focus on birthing and their new baby. The birth companion is an integral part of the HypnoBirthing experience. He or she practices with the mother to assist her during labor using hypnosis, relaxation techniques, visualizations, light touch massage, and receiving the new baby. All mothers are welcome in my class with or without partners. The partner is encouraged to participate. Is HypnoBirthing covered by insurance? All mothers are welcome with or without partners. The partner is encouraged to participate.